Hugo Chavez said: I am a Catholic and a Christian and a very committed Christian and I was talking to the Pope about the struggle against poverty -I call it Christs cause. Then he was talking about the first time he had met Fidel Castro. Search Alex Jones' website. Notice that not one word of Hugo Chavez's call for a NWO is mentioned. Why? Alex is supposed to be covering everything pertaining to a NWO. dictatorial powers as Hitler did through the Enabling Act. About two months ago, after hearing all the praise everyone was giving Chavez, including Alex Jones and others alike, I decided to look into this guy a little. I discovered that he called for a New World Order not once, but twice BEFORE everyone started praising him and this has bothered me greatly since I found this out. And today, for the THIRD time he has called for a New World Order so lets see if these big-shot 'truth seekers' will start talking about this now. I have emailed a link to Paul Joseph Watson (prisonplanet.com) so lets see if this article gets posted and if Alex Jones speaks out about this on his show... which is due to start in two and a half hours. I have also emailed Jack Blood and urged him to talk about this on his show. Chavez is part of the problems we are facing in the world today and it's time for everyone to stop talking about him as if he is some kind of god. My guess is that Chavez is part of the 'bring down America' agenda which we are clearly seeing taking place right now. himself to be a anti-semetic Jesuit coadjutor as well. Chavez Pushes Regional Military Alliance Against U.S.
Jan. 28 (Bloomberg) -- Venezuelan President Hugo Chavez called on Cuba, Bolivia and Nicaragua to form a military alliance to guard against attacks from the U.S.
Chavez said that U.S. military support for Colombia to help fight guerrillas and drug traffickers is a threat to Latin American unity, according to an e-mailed statement from the Information Ministry. Chavez on Jan. 26 said Colombia, the U.S.'s staunchest Latin American ally, is trying to provoke a war with Venezuela and planning ....aggression'' against him. Diplomatic relations between Colombia and Venezuela have deteriorated since Uribe withdrew his support for Chavez's negotiations with the Revolutionary Armed Forces of Colombia to secure a hostage release in November. Chavez didn't provide any details on how he's learned of the alleged U.S.-Colombia plan. The interdependence of Venezuela and the U.S. in trade makes it unlikely the situation will escalate, said Chappell Lawson, an associate professor of political science at Massachusetts Institute of Technology. Venezuela is the fourth- biggest supplier of crude oil to the U.S.
On Jan. 25, Colombian TV channel RCN, citing a confidential army report, said the Venezuelan government is conducting military exercises near the border with Colombia to prepare for an eventual confrontation with its neighbor. According to RCN, the Venezuelan government is confident that Colombia's biggest guerrilla group, known as the FARC for its acronym in Spanish, would lend its army aid and support in the event of a conflict. A spokesman at Venezuela's defense ministry declined to comment. Venezuela is our 4th largest oil exporter. CIA had made many attempts on Hugo Chavez's life in the past. Now with South America forming its own economic union (Banco Del Sur - Bank Of The South), the bloodsucking IMF World Bank will get kicked out of Latin America and Chavez would probably cut US off from their oil supply. We attacked Iraq because Sadam Hussein in 2000 wanted to switch to EURO and end Petro US Dollar. Iran was threatened by our military too for the same reason. Do you think US should ATTACK VENEZUELA? CARACAS, Venezuela (AP) — Venezuelan President Hugo Chavez urged his Latin American allies on Saturday to begin withdrawing billions of dollars in international reserves from U.S. banks, warning of a looming U.S. economic crisis. Chavez made the suggestion as he hosted a summit aimed at boosting Latin American integration and rolling back U.S. influence. "We should start to bring our reserves here," Chavez said. "Why does that money have to be in the north? ... You can't put all your eggs in one basket." Chavez noted that U.S. Secretary of State Condoleezza Rice visited Colombia in recent days, saying "that has to do with this summit." "The empire doesn't accept alternatives," Chavez told the gathering, attended by the presidents of Bolivia and Nicaragua and Cuban Vice President Carlos Lage. Chavez warned that U.S. "imperialism is entering into a crisis that can affect all of us" and said Latin America "will save itself alone." To help pool resources within the region, Chavez and other leaders were setting up a new development bank at the summit of the Bolivarian Alternative for the Nations of Our America, or ALBA. The left-leaning regional trade alliance first proposed by Chavez is intended to offer an alternative, socialist path to integration while snubbing U.S.-backed free-trade deals. Nicaraguan President Daniel Ortega joined Chavez in his criticism of U.S.-style capitalism, saying "the dictatorship of global capitalism ... has lost control." Three days earlier, Ortega had shouted "Long live the U.S. government" as he inaugurated an American-financed section of highway in his country. On Saturday, Chavez welcomed the Caribbean island of Dominica into ALBA, joining Nicaragua, Bolivia and Cuba. Attending as observers were the prime ministers of Antigua and Barbuda and St. Vincent and the Grenadines, along with officials from Ecuador, Honduras, Haiti and St. Kitts and Nevis. The ALBA Bank is to be started with $1 billion to US$1.5 billion of capital, Venezuelan Finance Minister Rafael Isea said Friday, according to the state-run Bolivarian News Agency. 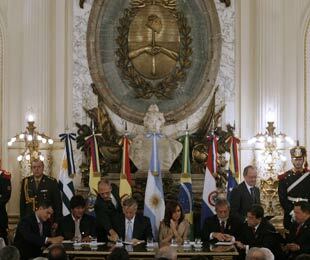 Latin American leaders launched the Bank of the South at a ceremony in Buenos Aires on Dec. 9, 2007. The back will support regional development in order to wean the region of institutions like the International Monetary Fund and the World Bank. 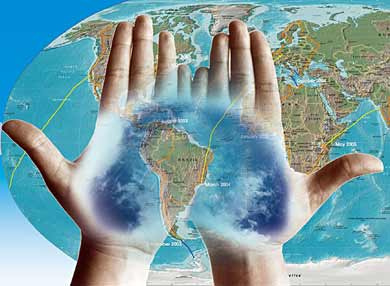 In the closing weeks of 2007, a region in revolt against the economics of corporate globalization issued its most unified declaration of independence to date. On Dec. 9, standing before the flags of their countries, the presidents of Argentina, Bolivia, Brazil, Ecuador, Paraguay and Venezuela, along with a representative from Uruguay, gathered in Buenos Aires and signed the founding charter of the Banco del Sur, or the Bank of the South. The Bank of the South will allow participating governments to use a percentage of their collective currency reserves to strengthen Latin America’s economy and promote cooperative development. It plans to begin lending as early as 2008 with around $7 billion in capital. By itself, the bank represents a serious challenge to U.S.-dominated institutions, such as the International Monetary Fund (IMF), the World Bank and the Inter-American Development Bank (IDB). As part of a larger trend, it signals a major break from the policies of “free trade” neoliberalism that dominated in the region throughout the ’80s and ’90s. There is good reason for those invested in the Washington Consensus to dislike the Bank of the South. In recent decades, the IMF, the World Bank and the multilateral regional banks have largely controlled poorer countries’ access to credit and development financing. These institutions allowed developing countries to avoid defaulting on their debt, provided funds in some difficult times and gave a nod of approval to private creditors. But the price the countries paid in return was steep. In order to stay in their good graces, developing nations have had to privatize industries, open markets to foreign businesses, liberalize capital flows, keep monetary policy tight and implement fiscal austerity (that is, cut needed social services for their people). In the end, such policies proved disastrous in Latin America. Per capita GDP, which had been growing at a steady rate throughout the ’60s and ’70s, grew hardly at all in the subsequent two decades of neoliberalism. During the latter period, the region also developed some of the highest levels of inequality in the world. The Bank of the South would work to remedy this situation. Unlike the preexisting financial institutions, the new bank will be run by Latin American countries themselves, will not be dominated by any single nation and will be free to support development approaches that are much more sensitive to the needs of the poor. With the exception of Paraguay’s Nicanor Duarte Fruto, each of the Latin American leaders involved in the Bank of the South was elected in recent years on a mandate to split from Washington. Well aware of the failures of economic neoliberalism in the region, and under pressure from an enlivened citizenry, the bank’s members have outraged the international business press by working to do just that. Several governments have moved to free themselves of direct oversight from the IMF by repaying loans early. In December 2005, Argentina and Brazil announced that they would pay off $9.8 billion and $15.5 billion, respectively. The IMF, which benefits from interest payments on long-term loans, was nonplussed. Since then, Latin American governments have been one-upping each other in their acts of defiance. In Bolivia, upon taking office in 2006, President Evo Morales announced he would let the country’s standing loan agreement with the IMF expire. In May 2007, he declared Bolivia would withdraw from a World Bank arbitration center that handles investment disputes, usually favoring corporate interests. Nicaragua has similarly rejected the authority of the center. That same month, Chávez announced that Venezuela would withdraw from membership in the IMF and World Bank altogether. While the country is still working out the details of this move, the prospect is unprecedented in the era of corporate globalization. The ability of oil-rich Venezuela to provide its neighbors with financing they previously might have needed to beg for from Washington is a significant factor in their willingness to break with the IMF and World Bank. Venezuela has offered billions in support to countries—including Argentina, Bolivia and Ecuador—and those backup funds make many countries less susceptible to threats of capital flight than in the past. Along with investments from China and India, it dramatically reduces Washington’s ability to starve dissident leaders of financial resources when governments grow, in its view, disobedient. The Bank of the South will help to formalize a source of alternative finance and place it under regional control. IMF lending has plummeted in recent years, as its supposed beneficiaries have launched a rebellion. Cutting ties with the fund is not just a Latin American phenomenon. Russia, Thailand, Indonesia and the Philippines have also pursued strategies of early debt repayment. Many Asian countries that were burned by the region’s neoliberal financial crisis in 1997 are building large cash reserves to prevent a return to the IMF in times of economic downturn, and they have recently worked on creating a regional currency exchange that will further increase their distance from Washington. These developments are sapping both the IMF’s influence and its cash flow. Its loan portfolio has dwindled from nearly $100 billion in 2004 to around $20 billion today. A single country, Turkey, now accounts for the bulk of its lending. The IMF has lost almost all influence in Latin America, with lending there plummeting to a paltry $50 million, less than 1 percent of its global loan portfolio. As recently as 2005, the region had accounted for 80 percent of its outstanding loans. Deprived of lucrative interest payments from poorer countries, the IMF is now desperately trying to meet its $1 billion administrative budget without dipping into its gold reserves. In stark contrast to the triumphalist pronouncements made in past fall meetings, in 2007 the IMF’s newly installed Dominique Strauss-Kahn confessed that “downsizing is on the table” for the institution. Ignoring the wider picture, pro-free trade pundits have generally responded to the Bank of the South by minimizing its significance and predicting failure. The Wall Street Journal characterized the bank as but one of Hugo Chávez’s many madcap schemes, insisting that it is “unlikely to live up to his grandiose vision.” Meanwhile the Economist asserted, “The IMF can sleep easy.” It pointed out that the Bank of the South’s founding agreement lacked many details about its governance and lending policies, and that disagreements persist among the region’s key players. It is true that Latin America has a history of internal disputes thwarting dreams of regional unity—and that quarrels persist today. While Venezuela and Ecuador have pushed for the bank to have a far-reaching mandate, Brazil prefers a more modest institution. To the disappointment of many of his progressive supporters, Brazilian President Luiz Inácio Lula da Silva has adhered to conservative economic policies designed to keep Brazil in good standing with foreign creditors. The country also runs a large internal development bank, which loaned $38 billion in 2007 to fund national projects. Therefore, Brazil has less to gain directly from making the Bank of the South into a robust regional lender. Activists, while generally positive, have expressed some concerns. Environmentalists worry the Bank of the South, while more democratically managed than its counterparts in Washington, may nevertheless develop a similarly destructive record of funding large-scale, ecologically harmful construction projects. Other progressives, ranging from the members of the Jubilee South coalition to Cuban commentator Eduardo Dimas, have argued that the institution must go beyond traditional development lending to support such measures as land reform, a common regional currency and projects explicitly designed to promote political solidarity in the region. These would more closely link the bank with the Bolivarian Alternative for the Americas (ALBA), an initiative through which the Venezuelan government has paid for Cuban doctors to provide services in the region and has promoted other forms of mutual assistance. Reservations about the Bank of the South’s mandate, however, should not obscure the swiftness and severity of Latin America’s assault on the international financial institutions. Chávez first floated the idea of the bank in 2006, and the speed at which it has come into existence has been shocking. The widespread support within Latin America for independent bodies such as the new bank suggests that the days when the United States could act as an economic overseer dictating policy for countries across the globe are coming to an end.